Kansas City and St. Louis have some of the largest libraries in the country. Keeping them in good repair is important, this includes concrete floor repair when needed. Repairing the concrete at the first signs that it is cracking or sinking will help avoid costlier repairs in the future. 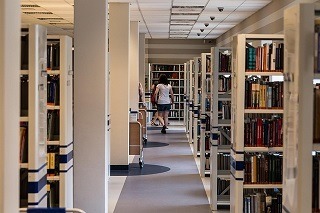 Since libraries are heavily used by the public, you want to make sure that a sinking concrete floor is not causing tripping hazards or causing damage to equipment or furniture. The soil beneath the concrete can constantly shift and move due to the variation of moisture content. This constant shifting also causes concrete to settle into the voids. Polyjacking.com uses high-density polyurethane foam to level and stabilize uneven concrete by filling in these voids. Polyjacking.com provides a cost-effective, long-term solution for commercial concrete repair in Kansas City and St. Louis. We use polyjacking to lift and stabilize concrete. This method is much more cost-effective than concrete replacement. 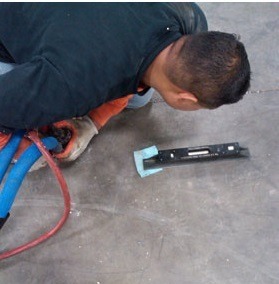 It decreases downtime as this process allows you to use the concrete immediately after the repair is complete. There are many advantages to using the polyjacking process for commercial projects. Polyurethane guards against moisture and dries quickly so the library can be used immediately. The foam creates a precise hydraulic lift that is strong enough to support a large amount of weight. We use a ground penetrating radar (GPR) to accurately locate these voids and to know where to inject the polyurethane foam. Because the GPR units are portable and provide an instant location, this system is a fraction of the cost of the X-ray method.